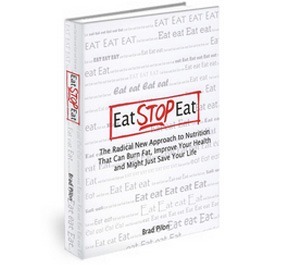 In November 2008 I bought and read the e-book Eat Stop Eat. This book is considered in the fitness circles to be the definitive guide to Intermittent Fasting. The author Brad Pilon was the first to my knowledge to exhaustively pour through the medical literature to study the effects of fasting on the human body. I decided that I wouldn’t do a review on it at the time. Instead I would test out the information. It would be premature to post a glowing review and then not make any health improvements. Behind the scenes I let my friend Nick know what I was up to. He decided to test out IF too and proceeded to lose 50 pounds. By April of 2009, I was convinced of benefit of IF and I posted exhaustively on the subject. Since then I have received several reports from friends and readers of how much fat they lost. Losing fat on a diet is no big deal. People do it all the time. The problem is that they often will regain the weight and more. This is why I waited so long to post a review of Eat Stop Eat. I wanted to see if the fat loss was indeed permanent. Based off my small sample pool it has been. It has with me. I carried a weight of 208-211 for almost decade, but since implementing Intermittent Fasting I’m weight stable at 190. This is the real deal. Art De Vany planted the idea of Intermittent Fasting in my head, but I needed more convincing. I wanted to know the nuts and bolts before I undertook such a radical change in my eating patterns. Eat Stop Eat was my guide. If you need help or guidance in beginning an Intermittent Fasting program, I highly recommend Eat Stop Eat. Eat Stop Eat anticipated and answered every concern I had about fasting. I’m 20 pounds lighter and this book gets a lot of the credit. Below is video by Brad Pilon compare fasting with exercise. Disclosure: Because I believe in this book, I signed up for their affiliate program. I hit a 500 lb squat while doing intermittent fasting. I don’t think I could live without fasting after having done it. My body’s own regulatory mechanism automatically shuts off my appetite. It’s much harder to overeat, particularly of carbohydrates after a while. Now that I’m doing a ketogenic intermittent fasting diet I feel superhuman amounts of energy. I go to the gym and I don’t even get tired. Looks like a very interesting read, but yikes – $40 for an eBook? Is it really THAT amazing? @Gil – The book is probably best for those that believe fasting will slow their metabolism or burn muscle. It answers all the critics with lots of research. If you already think IF has merit then the book is probably not as necessary – unless you need help. I really don’t know much about it. From what I’ve gathered from various sources it seems one version would be just every so often skipping breakfast, working out, and then eating lunch 15 hours after previous meal? The Eat Stop Eat method is two 24 hour fasts each week, but not on consecutive days. @Elizabeth – Congrats on the fat loss. http://www.fast-5.com its a free e-book. i have been doing ADF (water 1 day/juice the next for 12 days) and total fast no food no water for 3 days as well as occasional fasting 24 hour once a day. i could say that window fasting fits my schedule far better than any other at least for the moment. Paleo along with 19/5 rules.